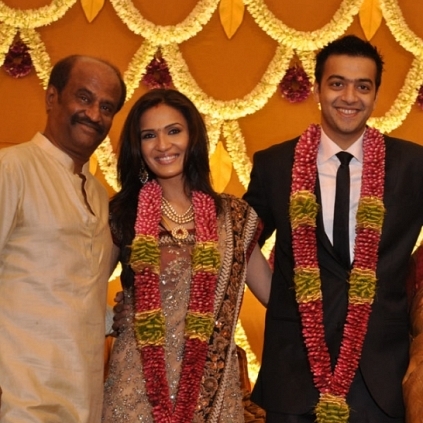 Superstar Rajinikanth’s second daughter Soundarya and her husband Ashwin were blessed with a baby boy, their first child, yesterday (6th May) at Apollo Hospitals Chennai. Mother and the baby are doing fine, reports add. Soundarya married businessman Ashwin in 2010 in a grand traditional wedding in Chennai. She later made her first film Kochadaiiyaan with her dad in the lead and it is the first Indian film to be made using performance capture technology. At the audio release function of the film, dad Rajinikanth had expressed his desire that Soundarya should start her family soon. Looks like his wishes have been fulfilled. Behindwoods wishes the new parents Soundarya and Ashwin on their latest elevation in stature as mom and dad! People looking for online information on Rajinikanth, Soundarya becomes a mom, Soundarya R Ashwin will find this news story useful.